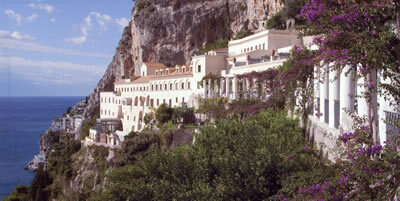 The Grand Hotel Convento di Amalfi looks magnificent, and it is magnificent. High up on the cliffs above Amalfi, its majestic stone fortress dominates this beautiful stretch of coastline as if it were a royal palace. But, of course, it was built for prayer, not politics. Nine hundred years ago the religious settled – as the religious quite often did – upon the most splendid site for miles around, and began their work for God and man. Over the centuries they were, by turns, expelled and restored, until finally – in the 1880s – the buildings became what they are now, an hotel. But what an hotel! 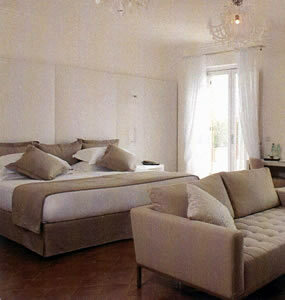 It has been restored at huge expense – but, then, Italy is full of ancient hotels which have been restored. 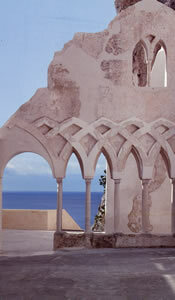 Yet what other hotel can boast an exquisite mediaeval chapel, a 13th century cloister and the Passeggiata dei Monaci, surely one of the most beautiful walks in the world? I arrived by taxi on the busy coastal road, way below the hotel. But, of course, I was not required to mount a single step. Two swish lifts transported me up to the reception floor. 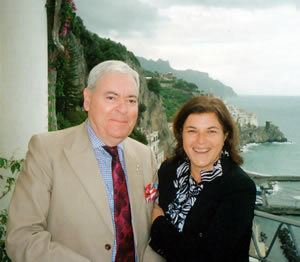 There I was greeted by one of the treasures of the Convento, its vivacious General Manager, Fulvia Clapier (pictured, with your correspondent). She is full of enthusiasm for her wonderful hostelry, and took me on a tour of the chapel and the cloister – which, of course, make a glorious setting for weddings. My own billet would not have made a bad setting for nuptials either, for it had a large terrace with remarkable views over the sea and the coast. Room 715 was, indeed, a ‘Sea view suite with terrace’ – and therefore 890€-1,500€ a night, including breakfast, according to season. This was an essay in what I shall call albino chic. (Indeed, most of the hotel’s interior is in pristine white – a décor which creates a sense of cool spaciousness throughout the property.) The walls, the furniture and the light fittings of the suite were all white, and found a pleasing contrast in the floor of brown tiles. I entered my apartment through a hallway off which was a walk-in wardrobe with the private safe. Then I was in the sitting room, with its sofa, upright armchair, writing desk and pair of large standard lamps. A French window opened onto the aforementioned terrace, which had more than enough space for two sun-loungers, a table, two chairs, an outdoor sofa (of exotic form) and – essential in these parts – a large sunshade. Back inside, two sets of glass double doors led into the bedroom. Here the lighting came from white chandeliers and two pretty crystal wall lights. In the bathroom, the whiteness gave way to brown marble. And here were all the accoutrements I required: a tub of good size, a separate shower, one wash basin, a loo, a bidet and lots of fluffy, white towels. I must now embark upon a paean of praise for the Passeggiata dei Monaci. It really is quite astonishing. 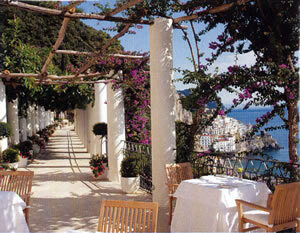 It became my habit to have my afternoon pot of Earl Grey on the terrace of the bar, and then to meander along this wonderful walkway, which is a sort of verdant lane, with the cliff rising up on one side and the miraculous views of Amalfi and its sea on the other. 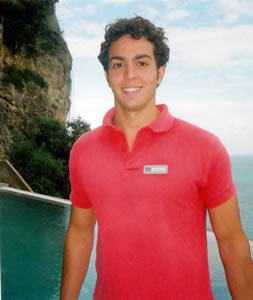 It sloped down gently – gently enough even for me – to the swimming pool, where I would find the friendly attendant, Vincenzo (pictured, in his red shirt), eager to provide me with further refreshment. These walks were so full of charm and intense pleasure that they confirmed my judgement that the Convento is a very special hotel. It also has a brilliant chef. Why Alberto Annarumma does not have a Michelin star, I do not know. He certainly deserves one, on the evidence of the meals I ate in the grand, vaulted dining room, the Ristorante dei Cappuccini. The staff wore brown, striped waistcoats, the napery was white, the glassware was by Bormioli and the napkins of those guests who left the table for a moment were refolded. 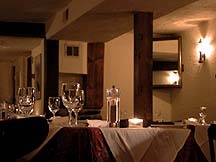 This was an impressive setting for Chef Annarumma’s imaginative and precisely executed food. 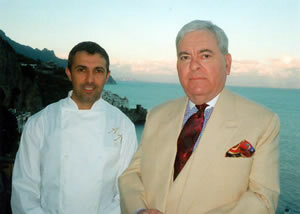 The service – orchestrated by the splendid maitre d’ Massimo Pisciotta – was also excellent, not least from Francesco, a charming fellow I last encountered in the London Ritz. I ate some superb dishes here. My only advice to the Chef (pictured) would be concerning presentation. His cooking is so good that it really does not need the array of strange crockery on which it appears. I still maintain that large, white, round plates are best. Still, that aside, allow me to detail the highlights of my meals. Red mullet with broad beans, burrata cheese, fish and citrus soup and balsamic vinegar was a treat for my eyes – with its colours of red, orange, green and white – and an example of perfect harmony in the mouth. Risotto with mascarpone cheese, lamb sweetbreads, pistachio nuts and Sarawak pepper was another well-balanced confection. Long tube pasta with a ragout of beef and onions was rich and sumptuous. And this kitchen is a whizz with meat. Grilled beef sirloin, although cooked pink, virtually fell apart, such was its delicious tenderness. The roasted lamb was just as good. But the star was the duck, which was magically flavoursome and tender. With braised fennel, wasabi mayonnaise and orange jelly, this dish climbed to giddy gastronomic heights. 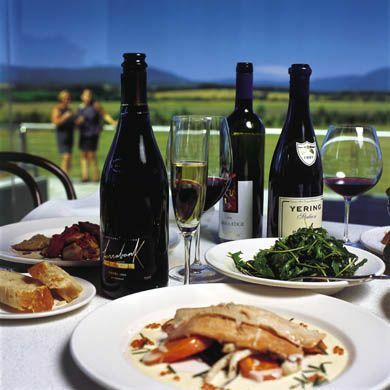 The wine list is rather limited for a dining room of this quality, although I was pleased to note that it gave both tasting notes and the alcohol level for each wine. But it is being improved – indeed, it grew by 20 entries during my stay. I counted 86 offerings, all of them Italian apart from the champagnes. Prices are kindly and run from 20€ for a Ligurian white (Colli di Luni) to 210€ for Krug Grande Cuvée. 2009 Tignanello is 85€. From my drinking, I would commend to you a red from Puglia, recommended by Massimo, which demonstrated yet again that one can drink well in restaurants in Italy without straining the wallet. This primitivo was full-bodied, earthy and delicious (Salento, Castello Monaci, 2009 - 25€). As Marie Antoinette (or was it Billy Bunter?) once opined, chaps should eat more cake. At breakfast each morning I followed the advice, because the croissants (and, indeed, all the brioche) on the extensive buffet were just so very good. And nor did I stint on the other comestibles, tucking in heartily to fresh pineapple and strawberries, Corn Flakes, apple tart and onion omelettes (the last brought to me from the kitchen). As always, pots of coffee, dishes of ice and the concluding cappuccini constituted my breakfast drinking. These morning occasions, on the restaurant terrace, shielded from the sun’s rays by the overhead shades and with the panorama of coast, sky and sea before me, were pure joy. And joy was my overwhelming emotion during my stay. 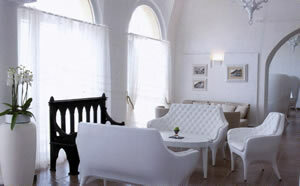 For the Grand Hotel Convento di Amalfi is a magnificent property. 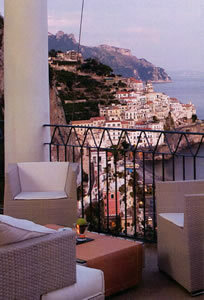 Via Annunziatella 46, 84011 Amalfi, Italy. Check the hotel website for special offers.